Citation Information: J Clin Invest. 2003;111(7):931-943. https://doi.org/10.1172/JCI18326. Ileal absorptive cell. Multiple brush border transporters couple ion influxes (Na+ and, in one instance, H+) to organic solute influxes or exchange one ion for another. Basolateral-membrane carriers facilitate diffusion of organic solutes and are not coupled to ion movements. 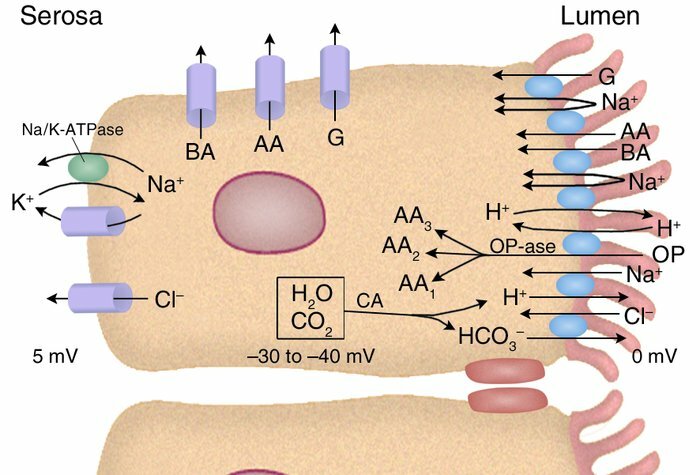 Na/K-ATPase in the basolateral membrane uses energy from ATP hydrolysis to drive Na+ extrusion and K+ uptake (3:2 stoichiometry), both moving against their electrochemical gradients. K+ and Cl– channels in the basolateral membrane open in response to cell swelling and elevations of intracellular Ca2+. Some of the cellular H+ and HCO3– extruded in exchange for Na+ and Cl– is provided through the action of carbonic anhydrase (CA). Additional HCO3– may enter the cell through the basolateral membrane NHE1 or the Na(HCO3)3 cotransporter (not shown). The cell electric potential is 30–40 mV negative relative to the lumen, providing an electric, as well as a chemical, driving force for Na+ entry via Na–organic solute cotransport. G, glucose or galactose; AA, amino acid (there are actually several amino acid carriers); BA, bile acid anion; OP, oligopeptide; OPase, oligopeptidase (almost all oligopeptides entering the cell intact are quickly hydrolyzed).